A GPK card leads the way in sales results. 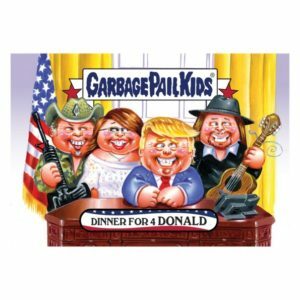 Today Topps revealed the print run for Garbage Pail Kids Trumpocracy – The First 100 Years card #155, and Network Spews #40-#43. A few weeks back Topps made a change to focus on more Wacky Packages, instead of GPK as part of the online exclusive releases. At the time Wacky Packages sold significantly more copies than their GPK counterparts. The trend now appears to be changing. The lone GPK card from Tuesday’s release led the way in sales with 236 copies. The Wacky’s were all over the place in sales in the 170-220 range. Was the change in sales because of the artwork? 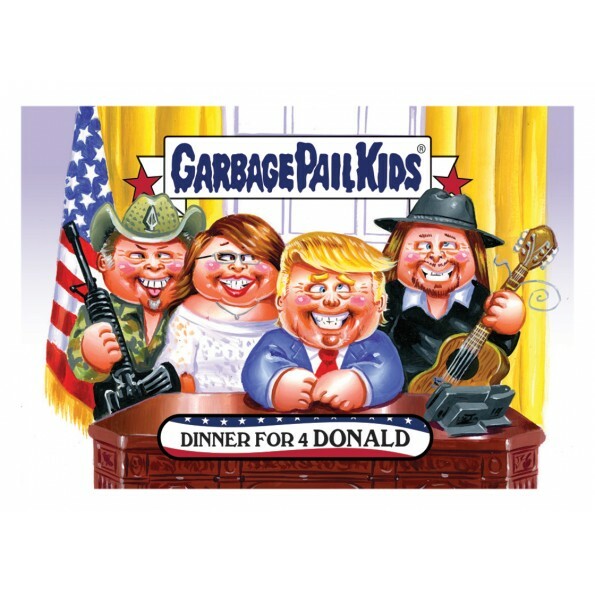 Was it because the GPK card was the only Trumpocracy card, while the others were Network Spews? Or is it just simply Wacky collectors tiring of the increase of online cards? How Topps decides to change up online offers after Trump hits 100 days will be interesting to see. Here are how the sales numbers came out for Tuesday’s cards. This entry was posted in Network Spews, Topps.com, Trumpocracy and tagged Network Spews, Topps.com, Trumpocracy by Jeff. Bookmark the permalink.